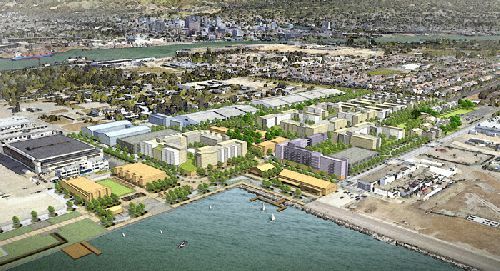 The first phase of the 68-acre Site A parcel at Alameda Point was transferred from the City of Alameda to Alameda Point Partners (APP), the City’s private partner for the project. 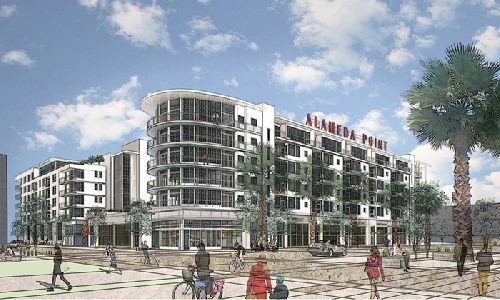 Alameda Point Partners is a joint venture between Trammell Crow Residential, srmERNST Development Partners, Madison Marquette, Eden Housing and financial partner Cypress Equity Investments. The transfer of the approximately 30 acres to APP paves the way for the mixed-use, transit-oriented waterfront development at the gateway to Alameda Point, called Site A. Trammell Crow Residential (TCR) is a division of Dallas, TX-based Crow Holdings. “Closing this deal and starting construction on Site A’s phase one $500 mil development is significant,” said Bruce Dorfman, Senior Managing Director of TCR’s Northern California division and a member of APP. Thompson Dorfman Partners was originally selected by the City to develop Site A (with its APP partners srmErnst and Madison Marquette) back in 2014, and merged with Trammell Crow Residential in 2015. The base closed over 20 years ago and several previous attempts to redevelop it failed. Besides offering unparalleled views of the San Francisco skyline and the Bay, with the new ferry and other transit options, Alameda Point is conveniently located to many of the region’s largest employment centers, Dorfman noted. Further, with the development of Site A, Alameda Point will become much more viable for companies that are seeking affordable expansion space with new quality housing for their employees. The first phase of the Site A project will consist of 673 housing units, including 130 units of affordable housing for low- and very-low income households, 310 units projected to be affordable to middle-income households, eight acres of parks and open space, funding for the Seaplane Lagoon Ferry Terminal, and 93k sf of retail development. Remaining financing for the affordable housing units is likely in the coming months. Completion of the new infrastructure is expected over the next two to three years, with the first new residences projected to open in 2021. •	Block 11 - sold to Trammell Crow Residential/Cypress Equity Investments joint venture to develop 220-unit apartment community and 15k sf of retail/commercial space. Upon buildout, the 68-acre master plan development will bring 800 residential units, including 200 affordable units, up to 600k sf of commercial space, 15 acres of parks and public open space, major utility infrastructure benefiting the entire property, and new transportation services and facilities, including a new ferry terminal. Construction of major infrastructure will commence later this month, including new water, sewer, electrical and gas lines, newly paved streets with bike and transit lanes, as well as eight acres of new parks. Also included in the Phase One transfer, $10 mil for a new Seaplane Lagoon Ferry Terminal, $3 mil in funds for affordable housing, and a $1 mil payment for a planned Sports Complex were provided to the City and its affordable housing partner, Eden Housing. “The 25% inclusionary (affordable housing) requirement at Alameda Point is higher than most cities around the Bay Area and will be a tremendous asset for creating the affordable housing Alameda so desperately needs,” noted Dorfman. “Working with our partner, Eden Housing, Site A will include 200 affordable units, including housing for very-low, low and moderate-income households. Site A makes an unprecedented investment in transit infrastructure with a package of multi-modal strategies that complement and build off each other, including the new ferry terminal, bus rapid transit, ‘last mile’ connection to BART (with shuttle service every 15-minutes in peak periods), bike and car sharing. All buildings will be constructed with a LEED™ Gold Certified rating by the U.S. Green Building Council or equivalent. These standards ensure a reduction of GHGs from heating, cooling and operations of the buildings. All Site A structures will be “solar ready” and meet the latest California Building Standards Codes for Solar Photovoltaic (PV). All parking facilities at Site A will include electric vehicle charging stations. The Site A project represents the first major public/private development at Alameda Point since Naval Air Station Alameda closed and lost 18,000 jobs in 1997. The project will create approximately 1,500 on-site permanent jobs and 2,500 direct construction jobs over the life of the project and serve as the catalyst for thousands of future jobs.